I previously stood on the sidelines and watched my friends, wife and colleagues lament about ye olde Walnut Whip and about how great they were and how they're so hard to get hold of and how they wish they could have one right now. Most of the time the conversation ends with "Oh my God!! You haven't lived!!!" when I chime in with my innocent little "What's a walnut whip?" and explain that we didn't get them when I was a kid growing up in deepest darkest Africa. Well, not anymore folks for today I finally had the opportunity to eat a Walnut Whip and, to be honest, it's definitely not what I was expecting. I was expecting a small little chocolate with a walnutty flavoured filling like a walnut praline, or little bits of walnut mixed in the chocolate like you get in nutty slabs of chocolate. Imagine my surprise when I opened the wrapper to a) discover a pyramid-shaped chocolate that is far from small - it's probably about 3cm high with a base of about 2cm in diameter - with a walnut stuck to the top and b) that that walnut is the ONLY walnut in the entire chocolate. 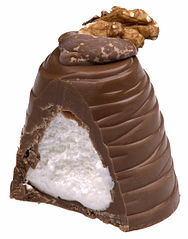 Instead of a nutty center, the chocolate pyramid is filled with a fluffy sticky marshmallow like you'd find inside a Tunnock's teacake or a Cadbury's Sweetie Pie. I like walnuts so I'm a little disappointed that I waited this long with the image of a walnutty chocolate only to discover what I'd imagined was completely wrong. It wasn't too bad in the end. I don't think I'll be going out of my way to have another one of these, but at least I can say I've had a Walnut Whip and can sort of understand what people are talking about when they get all nostalgic, just without the nostalgia part.